John Ling at http://www.johnling.net/ has very interesting posts on capitalism and Karl Marx. I have been in Vietnam a lot the past few months, and learnt a lot about their communist system. They are actually not communists anymore, they have turned socialist, though the communist party is still in charge. After listening to their entire history of poverty, lack of identity, lack of focus and power being in the hands of a few individuals, I have come to the conclusion that communism doesn't actually work. Take a look at their current living conditions. 1. Vietnam was in shambles after the war. 2. Today, the average wage of a government doctor is US300 a month. They resort to working overtime in private and selling medicines illegally to substantiate their living. And that's for a doctor! What more the menial worker? 3. Healthcare is not free. Health insurance taxes each worker 6% of his monthly salary. Their payout for medicines is capped at US300 per month. 4. Things are expensive in Vietnam. An average meal in a coffee shop costs RM5-6. more than in Malaysia. 5. Workers go everywhere on motorcycles. Public transport is very poor. 6. Retired oldies get prescription drugs for their own ailments, but instead of taking their medicine, they sell them for money, thus endangering their own health. There is no retirement or pension scheme. How to make the country richer? There is no other way. You have to let foreign investment come in and create more jobs for the people. Basically, you have to open your country to the world and not be isolated like a silo. Then with rising wages, you can levy more taxes, and your money pool will expand. So my conclusion: capitalism actually DOES work, BUT with a MINIMUM WAGE. That minimum wage is to ensure basic living conditions are met, and FREE basic provision of human amenities (like healthcare and education) is a must for any society to work. Most countries in EU are following this proviso (Germany, Switz, Austria), and are largely content. I am also scheduled to appear with other writers at the MPH High Tea with Writers' workshop on 27 Aug at 1 Utama. I have also begged all my friends to attend these sessions so I don't show up alone. Dear Lydia has agreed (hugs Lydia). I have also given my first interview to a local mag and will be doing another for a local newspaper next week. A newspaper has asked to serialize a couple of stories from my book. This is the first time they are doing this after more than a decade. Will post more when they actually occur. Hey! That's great! I'm sure lots of people will join you to learn about how to write (and getting paid too!) Count me in too! Dear Yvonne, Hugs!! But are you sure your (ahem) boss will let you go on a weekend? Hi Xeus, no wonder it's been so quiet on your blog. I've visited HCMC in 2004 and am struck by their backwardness. But they are a very resilient and warm people, at least those whom I came across. Good to hear of your publicity efforts. 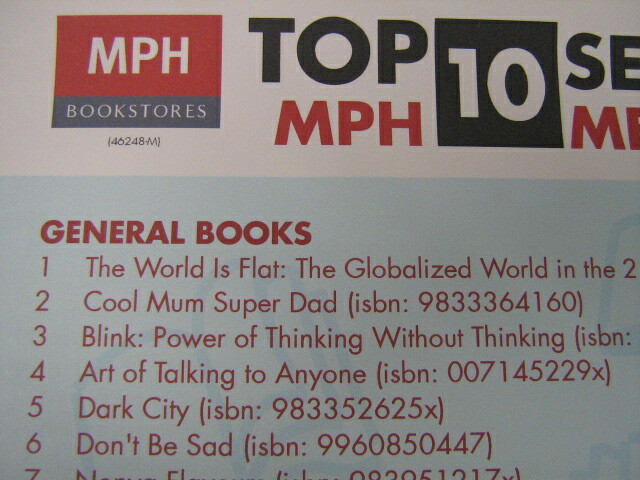 I look forward to seeing you at MPH. Which paper is doing the serialising? Aren't you thrilled that they're doing this for you for the first time in more than a decade? It's the newspaper you write for....I asked them for angles, and they came up with this one rather than anything I suggested. They asked me to pick 2 stories already. Will announce it once it's actually published. I haven't seen them serialize anything since .... dunno, the eighties? Nineties? I remember their short story competitions that were fun. But I also remember being a teenager at that time and having my friend tell me, "Forget submitting. You won't win anything. The real career writers will submit as well and win everything." I've read your book and am amazed by the twistedness of your mind! A very good writer, you are. My hat's off to you! God knows we need more writers to increase the book count by Malaysian English authors. You, like John Ling, Lydia, Chong Sheau Ching and Yvonne Foong, are my favourite English authors...and is it any wonder there's only one guy in that bunch? Dear Eternal wanderer, thank you so much! It's feedback like this that brightens a writer's life and makes them believe all the headache and heartache is worth it. I hope to see one of your works published soon too. We need as many Malaysian writers as we can get. Dear Sharon, thanks so much for buying my book! It will never be considered high-brow like the ones you write and edit, so I hope you will be moderately entertained anyway. Anyway, it's good now and then to see how Malaysian pulp fiction is getting along, right? Hee hee.